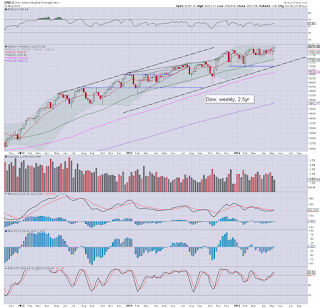 It was a somewhat choppy week in market land, with significant Tue/Wed weakness to sp'2085, but then strongly rebounding. 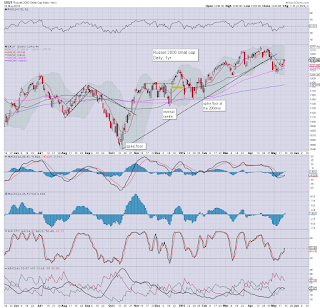 The sp'500 saw a moderate net weekly gain of 6pts @ 2122. 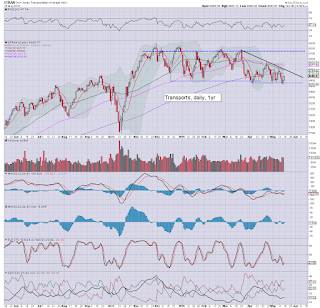 Transports saw notable weakness, with a net weekly decline of -1.0%. 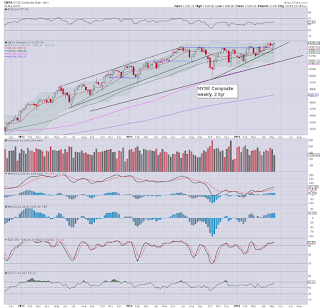 The sp'500 saw a moderate net weekly gain of just 6pts, but that was a full 37pts above the Wed' low of 2085. The closing candle is offering yet another spike floor, and it bodes for further upside in the near term. Underlying MACD (blue bar histogram) cycle has turned positive for the first time since March. Momentum is now a touch in favour of the equity bulls. In terms of upside.. the weekly bollinger is offering the 2140s before end May, with the 2170s just about viable by the next FOMC of June 17th. 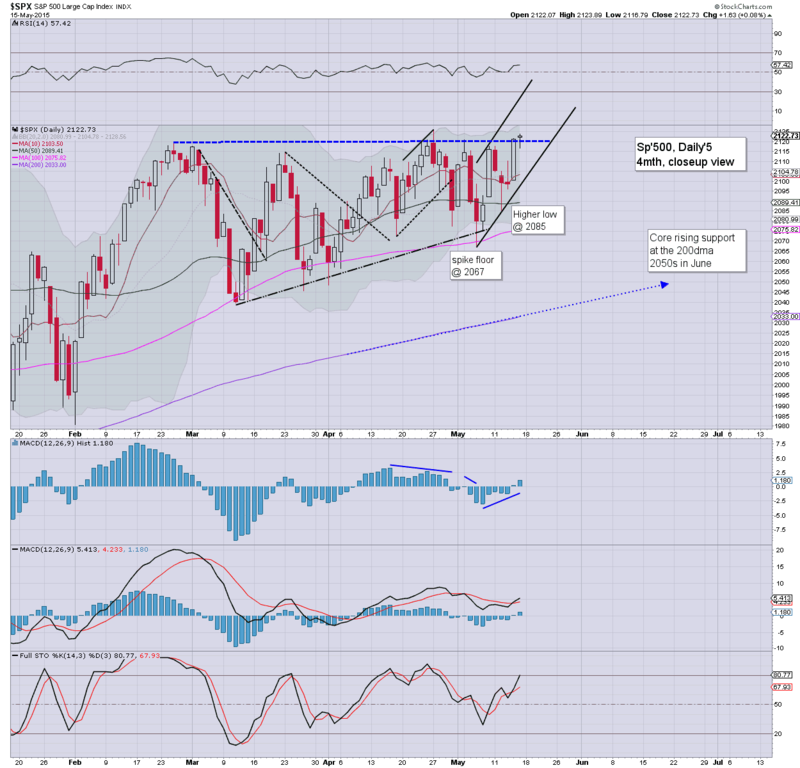 Without question, the broader trend remains bullish.. if choppy. Until 2K is broken under, the equity bears have nothing to tout. 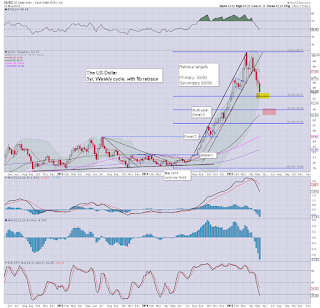 The tech' managed a borderline sig' gain of 0.9%, and is a mere 84pts shy of the March' 2000 high of 5132. Weekly upper bol' will be offering the 5160/70s next week, the door is wide open for the equity bulls to bring the last index yet to break a new historic high. The mighty Dow climbed 81pts, settling the week on a high @ 18272, a mere 16pts shy of the March high. 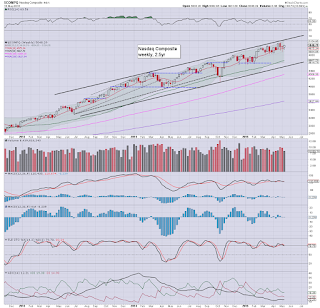 Underlying MACD cycle has turned positive for the first time since March, and can comfortably tick higher for another 3-4 weeks, at which time the Dow will probably be in the 18400/600s. The master index climbed just 0.3%, but looks set to break new historic highs next week. The 11300s look due by end month. 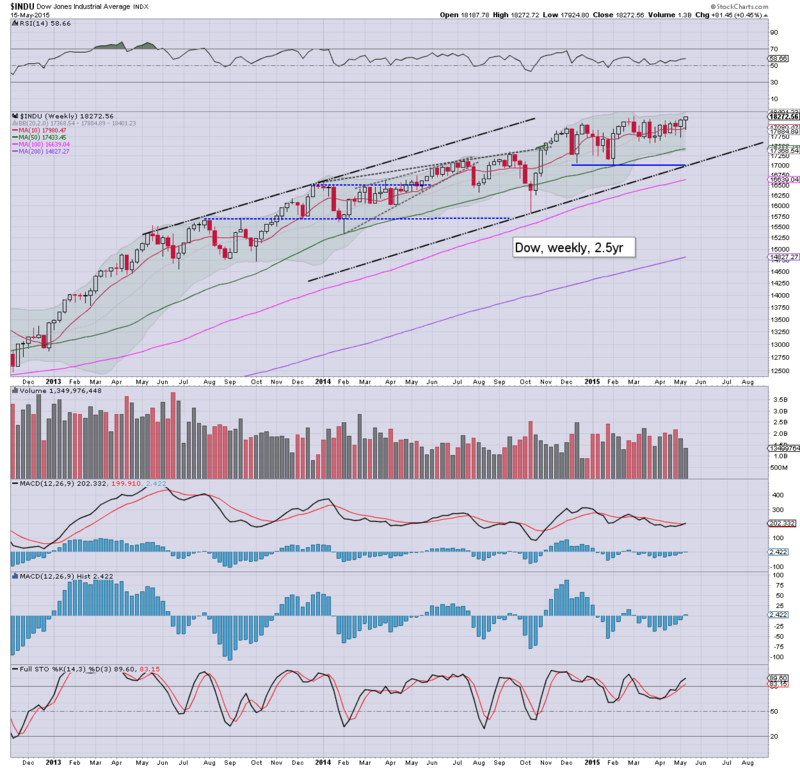 A weekly/monthly close in the 11400s - along with Nasdaq comp >5132, would be powerfully bullish signals for the summer. The second market leader is clearly struggling, but still managed a net weekly gain of 0.7%. Underlying MACD cycle ticked lower, and is now negative for the second consecutive week, which is the most bearish since last Oct'. 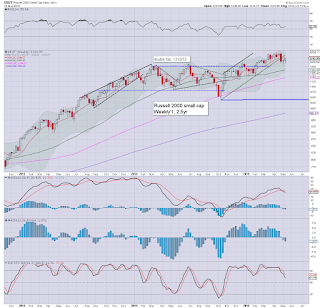 New historic highs are only a few percent higher, but that will not be easy as the R2K looks very tired. 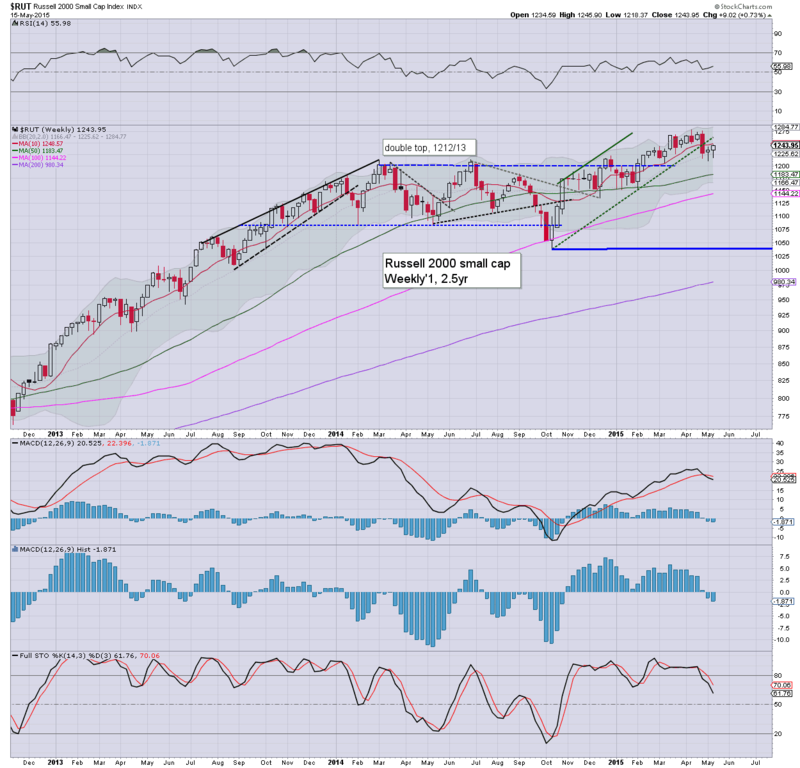 For the equity doomer bears, on any 'reasonable' outlook, the R2K should comfortably hold the giant 1000 threshold this year, with strong support in the 1075/50 zone. 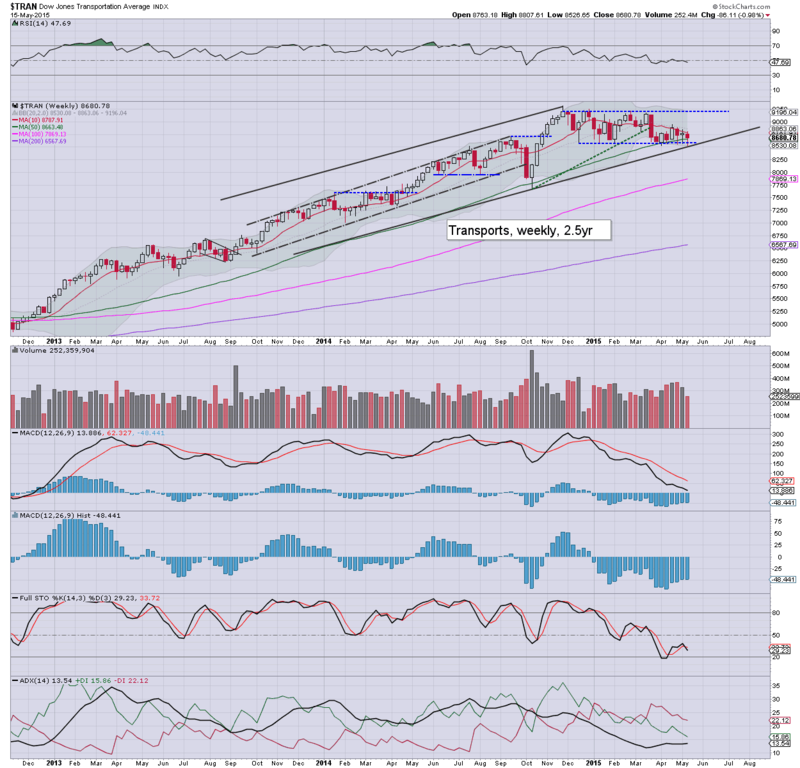 Rather critical support into end May will be 8600/500s. 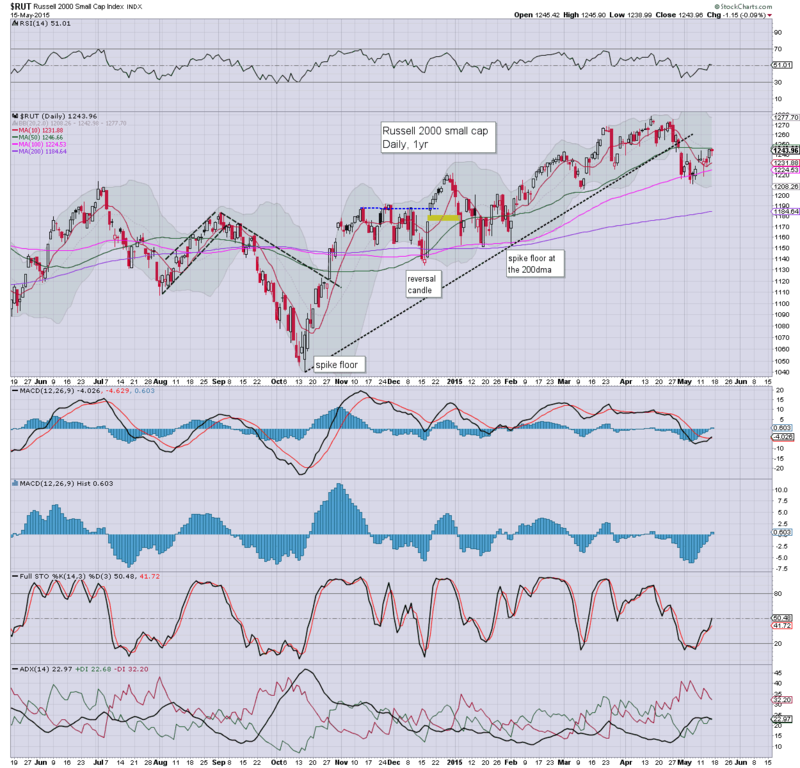 Any sustained action <8500 would arguably be a major early warning of broader market weakness to come. If 8500 is lost, first target is the 8000/7700 zone. It is also important to keep in mind that any further renewed upside in Oil prices will keep extra downward pressure on the Transports. So, 5 of 6 indexes saw moderate net weekly gains. 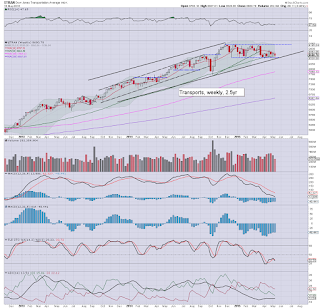 The 'old leader' - Trans, was the standout laggard, with a sig' net weekly decline. 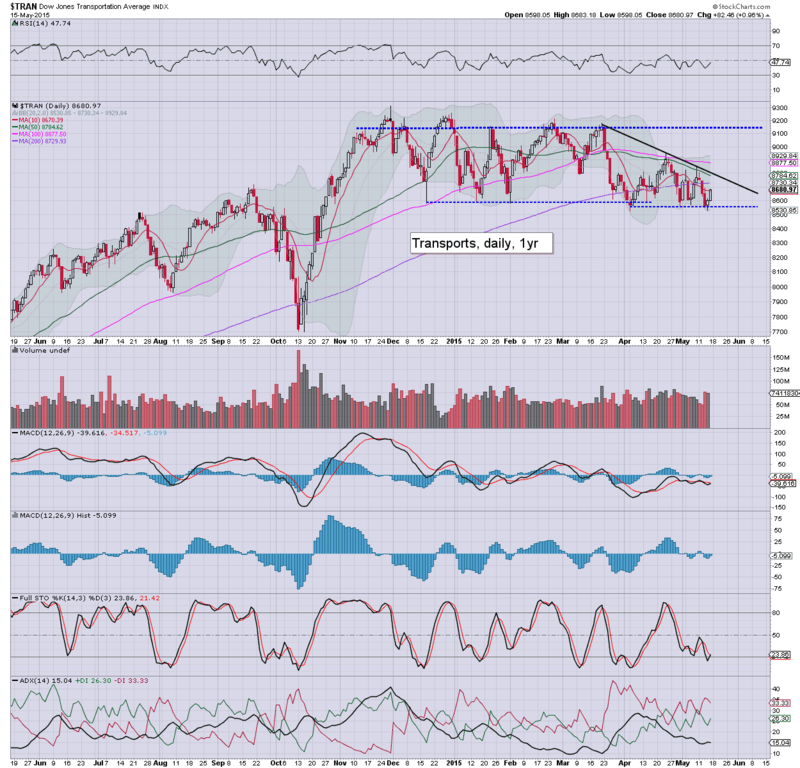 Mr Market could very well be offering traders an early warning of 'summer trouble' via the Transports. 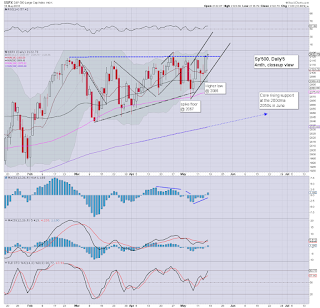 However, as a collective, the broader market remains strong.. if pretty choppy. 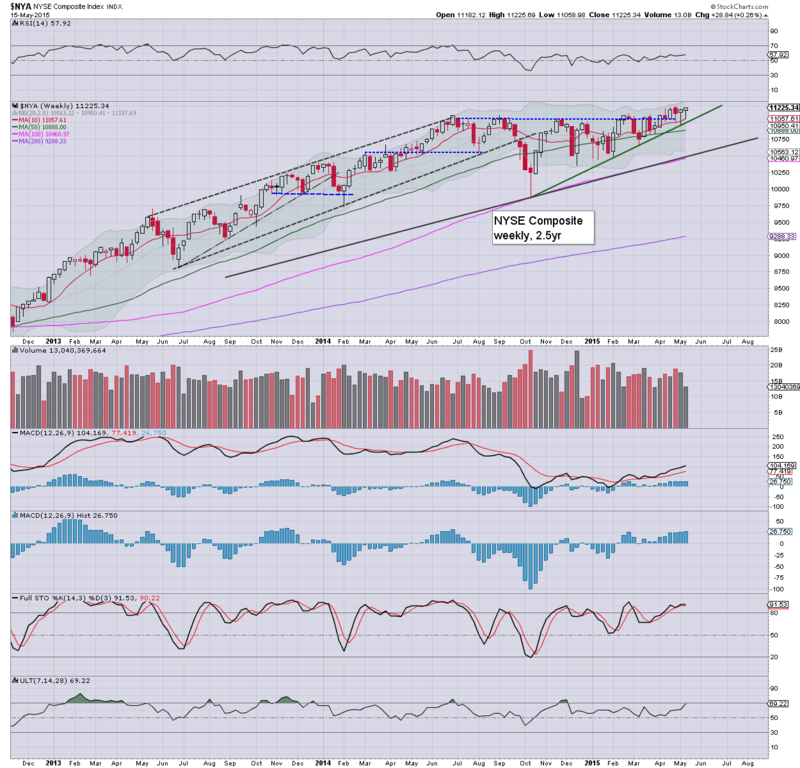 New historic highs look due for most indexes into June. 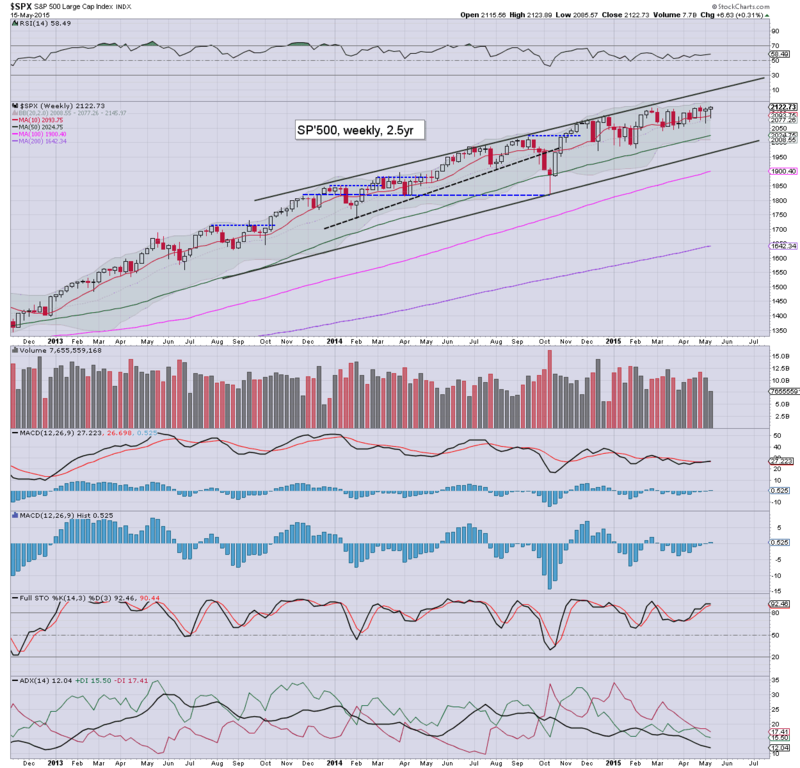 Equity bulls should be seeking a monthly close of Nasdaq 5200s, Dow 18700, R2K 1300, NYSE comp'11400s, to give clarity that the market will keep on rising until the Sept/Oct time frame. There isn't too much due next week. Friday will be somewhat quieter than normal, since the following Monday (May 25th') USA markets are CLOSED for memorial day. *there are numerous fed officials on the loose next week. Most notable, the Yellen is due to speak Fri' 1pm on the economic outlook. Mr Market will be listening! 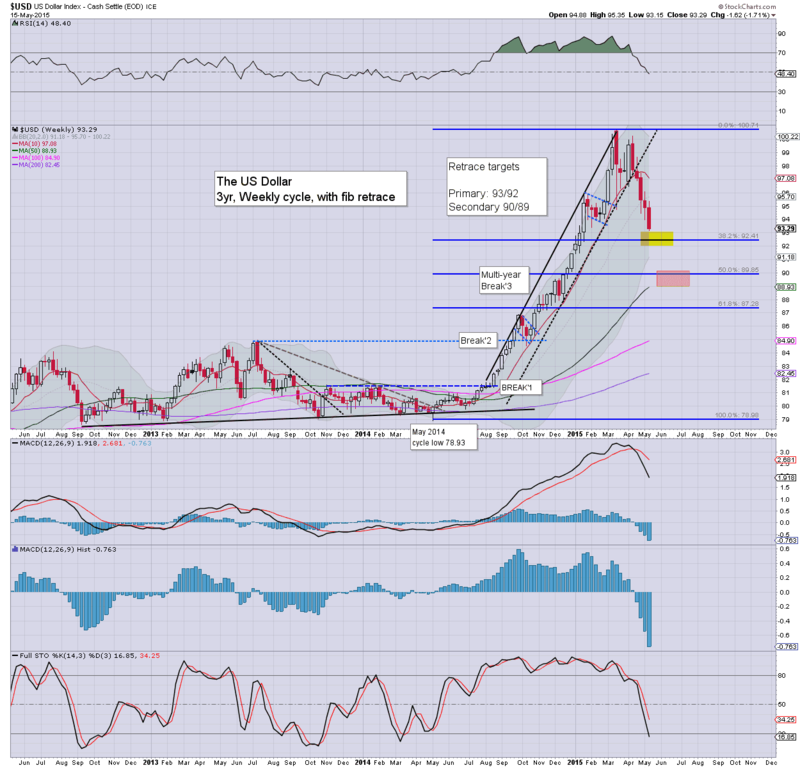 The USD saw a fifth consecutive net weekly decline, -1.7% @ DXY 93.29. There remains high threat of a 1-2 week bounce back to the 95/96s, before a further wave lower to 90/89 this summer. 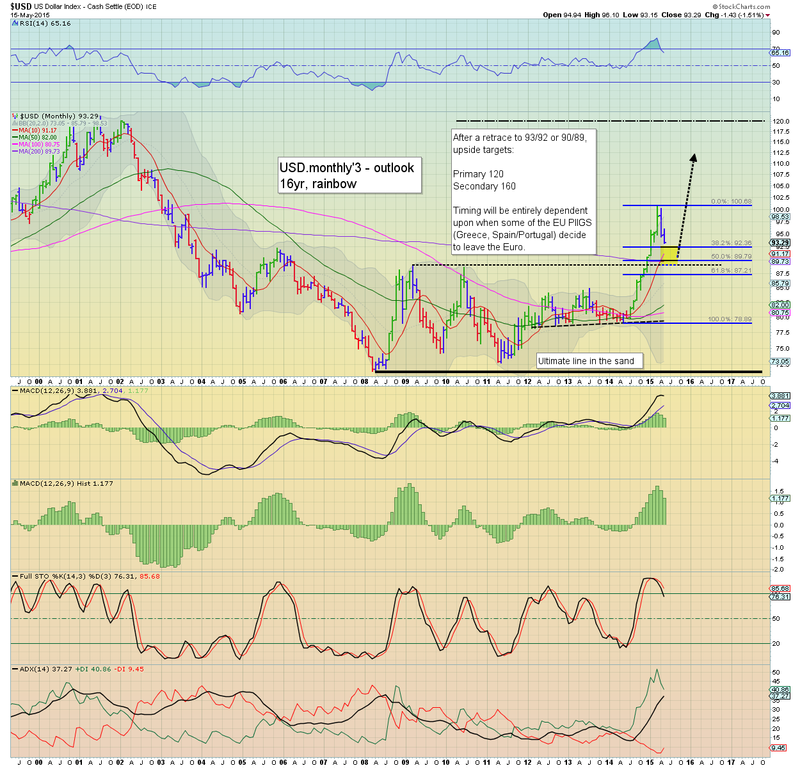 The broader hyper-upside target remains the 120s.. but that is clearly unlikely this year. *USD is now around -7.5% lower since the March high. Its been a tiresome week... I'll leave it at that. 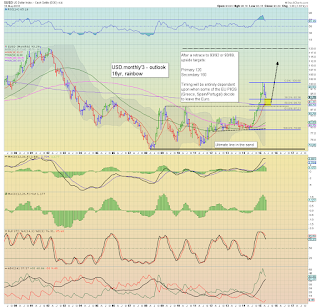 *the 'old leader' - Trans, remains particularly weak, not least as Oil prices remain close to $60. Little to add. Most indexes look set for marginal new historic highs into June. 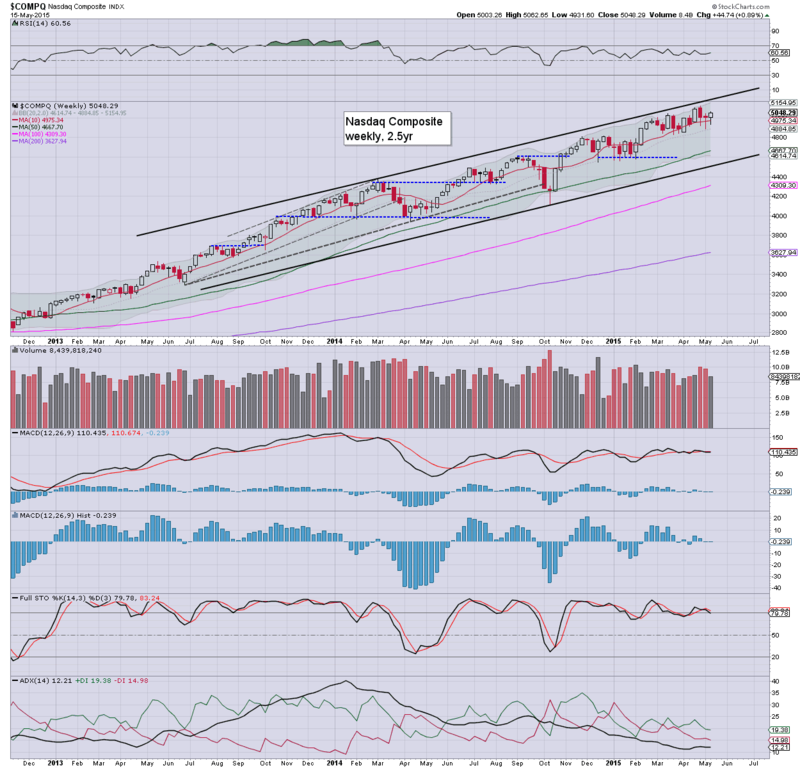 What would be especially notable is if the Nasdaq comp' can break/hold 5132.. which is only 2% higher. 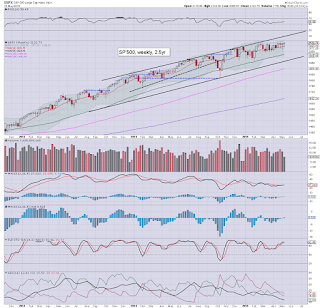 The ultimate bullish signal for this summer would be a monthly close in the 5200s.